Looking to escape the ordinary experience of an all-inclusive chain hotel? Look no further than Hotel Esencia. Roughly forty miles south of Cancun, and a world away from Playa Del Carmen, you will find a serene and secluded section of the Riviera Maya. The 50-acre private estate, once the holiday retreat of an Italian Duchess, is a favorite for those who want to escape and those who crave privacy, luxury and exclusivity. Just this past week, fashion designer Jason Wu selected the fashionable resort to wed his longtime partner Gustavo Rangel. 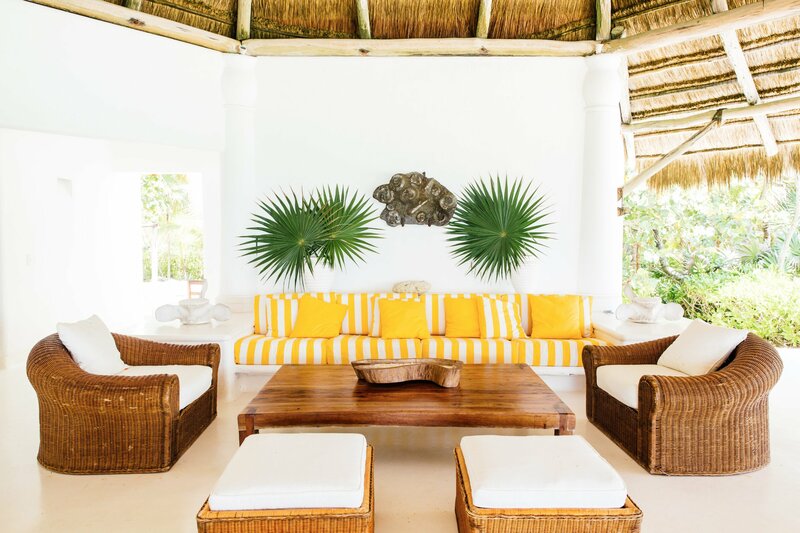 The main structure at the Esencia houses a handful of guest rooms, while the majority of the guest quarters are situated in free-standing beach cottages. Rooms feature high ceilings, pristine white walls and floors with large picture windows that frame lush gardens or serene sea views. Start the day with morning yoga, indulge in an aromatic body wrap, swim with sea turtles just a few feet from the shore of the hotel beach or sip margaritas from acid yellow mid-century-modern chairs.